Mile Markers: City Reach New York City? Could City Reach New York City become a reality in 2016? We are not sure yet but we are praying about it and willing to explore the possibility! It is no secret that we have prayed about and looked for open doors to take City Reach to the eastern seaboard of the USA and especially the New York City area. We spent four days there in the summer of 2014 walking around, driving around, talking with people and praying for God's direction. We have never kicked in doors and by the grace of God we never will. When nothing opened up in New York we left it in God's hands where it belongs. I mentioned City Reach when we were preaching in West Harrison the week of New Years and I mentioned our desire to eventually go to New York City area. Much to my surprise, a possible door for New York City opened for us in south eastern Indiana that night! You might say that to get to NYC we had to go a round about route through South America. Bro. Hobert Bowling, former Pastor of the church, has been doing missionary work and providing teaching materials in Guyana, South America for many years. 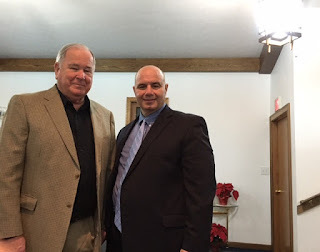 Pastor Wade Hicks has assisted Bro. Hobert in the Guyana effort and they have both made numerous trips to Guyana. After church, Bro. Hobert mentioned he knew some folks in New York City. One of the Guyanese Pastors they had mentored and helped had moved to New York City and they have been helping him get a church started there. He said there was a large population of Guyanese in New York City. I did some research on it and it seems that the borough of Queens in New York City has several tens of thousands of Guyanese immigrants. Many of them are Hindu but a small portion of them are Christian people. They are all English speaking since Guyana is an English speaking nation in South America. Pastor Hicks told their Guyanese Pastor friend in Queens about us and about our vision of City Reach and in a few days it all came together. Pastor Ivan Hardyall has invited us to visit them and to share our burden with them as soon as possible. Kelly Jo and I will fly from Dallas to NYC on February 19th, meet with some Pastors on the 20th, preach for Pastor Hardyall on Sunday the 21st and then fly back the 22nd. It will be a whirlwind trip but it is a whirlwind full of possibilities! Pastor Hardyall has not been in America for very long but he feels like he will be able to put us in touch with Pastors that could pull a City Reach campaign together. We will go with open minds and willing hearts and see what God may have in store for us. At the very least it is a new place for us to minister now and in the future. AND it may be an open door for our vision of City Reach to enter New York City this summer. Will you help us pray about this exciting possibility? There are some specific things that come to mind that I would love for you to pray about. -Pray that God would put us in the right place, speaking the right Word, to the right people that weekend in February. -Pray that God would prepare hearts in Queens to receive us in the same spirit we are going. I want them to see my heart and know that I am ready and willing to assist them in the kingdom of God. -Pray that God would direct us AND the preachers we will be working with if a City Reach campaign is meant to be in 2016. We desire to be guided by God's divine will. -Pray that we will know God's will when we see it and know God's Word when we hear it, EVEN if His will and Word seem contrary to our desires. We do not want to be in Queens this summer without God's will, but we do not want to be some where else IF Queens is the place for us. -Pray for our safety and the safety of Pastor Wade Hicks who will be traveling with us to NYC. I would appreciate you praying about these things and passing this onto others that pray as well. May God bless you for it. There are some specific things to praise God for as well. -Praise God for an open door to minister in Queens, that was revealed to us in West Harrison, Indiana, about the last place I expected it. God's providence amazes us! -Praise God that Bro. Bowling and Pastor Hicks have confidence in us to recommend us to Pastor Hardyall and his friends. -Praise God that we are able to make this last minute trip because God had already directed us to keep our schedule flexible this winter and we have diligently prepared our finances (by God's grace and the kindness of God's people) for possibilities like this. -Praise God for the faith to believe that all things are possible to him that believes! I tell you friends, these are exciting times! Praise God!